There are plenty of movies that like to remind us how small the world is by revolving their plots around characters whose lives are connected by pure chance. Sometimes this works. Sometimes it doesn’t. So where does Magnolia fit? It has the interconnected plots. It has the multiple characters. It has the star power. 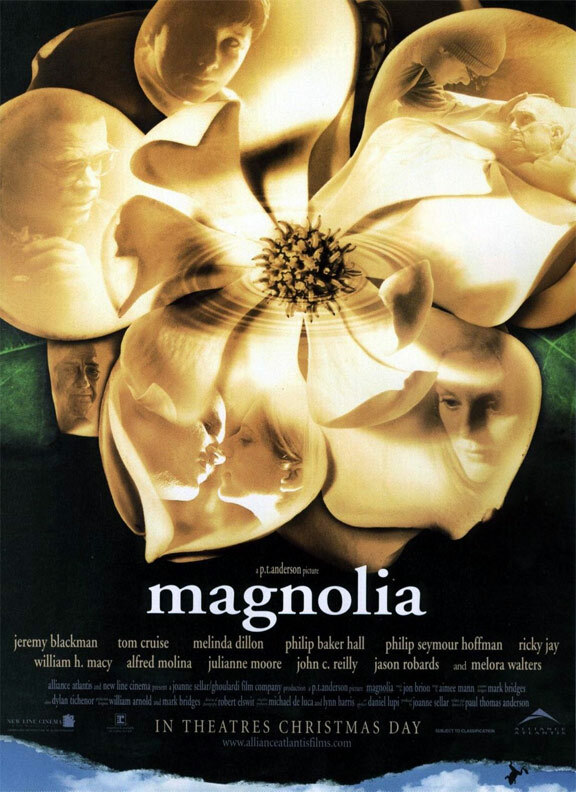 And I ended up finding Magnolia somewhat contrived as the other movies that are somewhat similar. I can always appreciate good performances. In Magnolia Tom Cruise and Julianne Moore as the estranged son and second wife of a dying television producer stand out. (Cruise was nominated for an Oscar.) But for me that isn’t enough. Am I supposed to be moved by the characters suddenly breaking into a performance of Aimee Mann’s “Wise Up”? This sequence does play into the one refreshing aspect about Magnolia, especially when it comes to films with multiple interrelated characters: it begins with a legend. Three urban legends that imply how serendipitous life can be are told in the prologue. Though not mentioned throughout the course of the movie, these stories are not lost on or forgotten by the audience as the movie moves forward. By basing Magnolia, just a bit, in urban legends, director Paul Thomas Anderson saves the film from reaching a certain level of moralizing. Instead the events of the film feel more due to circumstance and we are left to question the true nature behind everything. Most of all, these urban legends give Magnolia an entertaining and engaging jolt to begin and end on. I’m religious (Episcopalian) and found the film to be rather gloomy, not uplifting. Tom Cruise has the best performance, and William H. Macy’s barroom breakdown is one of the best scenes he’s done. Still, this film is overrated Oscar bait.